Download "Kristina M. Blaiser, Ph.D., CCC-SLP"
1 Kristina M. Blaiser, Ph.D., CCC-SLP CONTACT 2620 Old Main Hill #156 Phone: (435) INFORMATION Logan, Utah EDUCATION University of Minnesota February 2010 Ph.D.: Speech-Language-Hearing Sciences Dissertation: Effects of Noise on Word Learning in Preschool Children with and Without Hearing Loss University of Minnesota May 1998 Master of Arts: Speech-Language Pathology University of Wisconsin-Madison May 1996 Bachelor of Science: Communication Disorders CURRENT APPOINTMENT Assistant Professor, Department of Communicative Disorders and Deaf Education Director, Sound Beginnings, Utah State University Supervise and coordinate Sound Beginnings staff members in a demonstration program of early educational services for children with hearing loss as part of the Utah State University s Listening and Spoken Language Program Supervise graduate students in the Listening and Spoken Language program Partner with Utah Schools for the Deaf and Blind to develop service delivery model for children from birth to five years of age Develop and evaluate program effectiveness including assessment, intervention and curriculum protocols Collaborate with Listening and Spoken Language faculty members on upcoming research projects PROFESSIONAL EXPERIENCE Assistant Professor Spring 2010 Idaho State University Executive Director Northern Voices Supervised 14 staff members in a non-profit organization providing early intervention services for children with hearing loss and their families. Staff includes speech-language pathologists, teachers of the D/HH, early childhood specialists, and administrative team. Responsible for increasing enrollment from 15 students in 2007 to over 50 students in Monitored child outcomes through collection and analysis of data. 3 Wing, C., Kohnert, K., Pham, G., Cordero, K., Ebert, K., Kan, P. F. & Blaiser, K. (2008). Culturally consistent treatment for late talkers. Communication Disorders Quarterly, 29, BOOK CHAPTERS Blaiser, K. & Culbertson, D. (submitted). Language and Speech of the Deaf and Hard of Hearing. In R. Schow & M. Nerbonne(Eds. ), Introduction to Audiologic Rehabilitation, 6 th Edition. Boston, MA: Pearson. FUNDING 2011 U.S. Department of Education, Office of Special Education Porgrams and Rehabilitative Services. Graduate Specialization in Auditory Learning and Spoken Language for Graduate Students in Speech-Language and Audiology. (Principal Investigator: K. Todd Houston; Project Director: Kristina Blaiser ( ). ($750,000). TELL (Toddler Early Listening and Language) Group at Idaho State University. $1000. Idaho Community Foundation: Boise, ID. Business Growth and Development at Northern Voices. $25,000. First Children s Finance: Minneapolis, MN. PROPOSALS SUBMITTED 2011 Institute of Education Sciences. Development of a Tele-Intervention Model for Infants and Toddlers with Hearing Loss. (Principal Investigator: Karl White; Co-Investigators: Kristina Blaiser, Karen Muñoz, Catherine Callow-Heusser, Diane Behl, Lauri Nelson, & Lisa Boyce.) ($1,500,000). 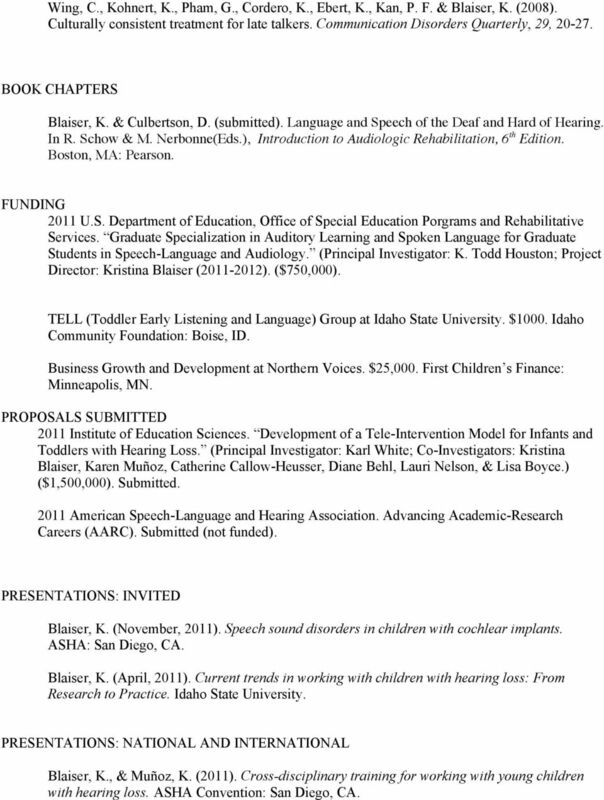 Submitted American Speech-Language and Hearing Association. Advancing Academic-Research Careers (AARC). Submitted (not funded). PRESENTATIONS: INVITED Blaiser, K. (November, 2011). Speech sound disorders in children with cochlear implants. ASHA: San Diego, CA. Blaiser, K. (April, 2011). Current trends in working with children with hearing loss: From Research to Practice. Idaho State University. PRESENTATIONS: NATIONAL AND INTERNATIONAL Blaiser, K., & Muñoz, K. (2011). Cross-disciplinary training for working with young children with hearing loss. ASHA Convention: San Diego, CA. 4 Olszewski, A., & Blaiser, K. (2011). Comparing narrative elicitiation models for preschool children with hearing loss. ASHA Convention: San Diego, CA. Blaiser, K., Olszewski, A., & Preston, E. (2011). Understanding linguistic complexity of sentence recognition tasks: Implications for preschool populations. ASHA Convention: San Diego, CA. Blaiser, K., Moosman, M., Doughty, E., & Houston, K.T. (2011). Grief and family involvement. 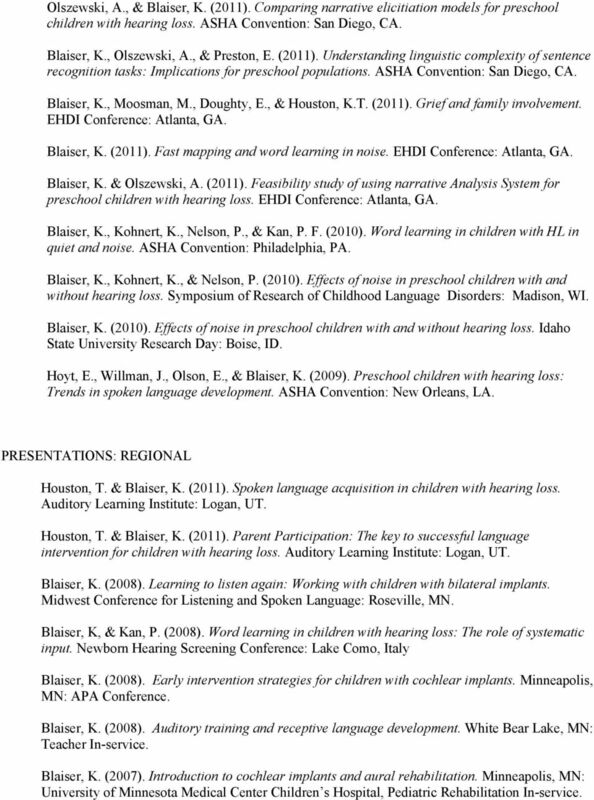 EHDI Conference: Atlanta, GA. Blaiser, K. (2011). Fast mapping and word learning in noise. EHDI Conference: Atlanta, GA. Blaiser, K. & Olszewski, A. (2011). Feasibility study of using narrative Analysis System for preschool children with hearing loss. EHDI Conference: Atlanta, GA. Blaiser, K., Kohnert, K., Nelson, P., & Kan, P. F. (2010). Word learning in children with HL in quiet and noise. ASHA Convention: Philadelphia, PA. Blaiser, K., Kohnert, K., & Nelson, P. (2010). Effects of noise in preschool children with and without hearing loss. Symposium of Research of Childhood Language Disorders: Madison, WI. Blaiser, K. (2010). Effects of noise in preschool children with and without hearing loss. Idaho State University Research Day: Boise, ID. Hoyt, E., Willman, J., Olson, E., & Blaiser, K. (2009). Preschool children with hearing loss: Trends in spoken language development. ASHA Convention: New Orleans, LA. PRESENTATIONS: REGIONAL Houston, T. & Blaiser, K. (2011). Spoken language acquisition in children with hearing loss. Auditory Learning Institute: Logan, UT. Houston, T. & Blaiser, K. (2011). Parent Participation: The key to successful language intervention for children with hearing loss. Auditory Learning Institute: Logan, UT. Blaiser, K. (2008). Learning to listen again: Working with children with bilateral implants. Midwest Conference for Listening and Spoken Language: Roseville, MN. Blaiser, K, & Kan, P. (2008). Word learning in children with hearing loss: The role of systematic input. Newborn Hearing Screening Conference: Lake Como, Italy Blaiser, K. (2008). Early intervention strategies for children with cochlear implants. Minneapolis, MN: APA Conference. Blaiser, K. (2008). Auditory training and receptive language development. White Bear Lake, MN: Teacher In-service. Blaiser, K. (2007). Introduction to cochlear implants and aural rehabilitation. Minneapolis, MN: University of Minnesota Medical Center Children s Hospital, Pediatric Rehabilitation In-service. 2008 The University of New Mexico, Albuquerque, NM, Ph.D. in Educational Psychology; Cognitive Science and Research Methods/Statistics. Early Intervention Specialists: Where are the Gaps? CURRICULUM VITAE AMBER THIESSEN, Ph.D., CCC-SLP Department of Communication Sciences and Disorders 114 Clinical Research Services althiess@central.uh.edu Houston, TX 77004 (713) 743-5990 EDUCATION Ph.D.
What Are the Communication Considerations for Parents of Deaf and Hard-of- Hearing Children? Curriculum Vitae. Dana Lynn Wagner. Minnesota State University, Mankato 313 Armstrong Hall Mankato, MN 56001 507.389.5653 dana.wagner@mnsu. AP4 CommDis Strategic Plan 1 Division of Communication Disorders AP4 Strategic Plan (2015-2020) 1. What is the current status of your Academic Unit? a. Constituencies served and constituent needs addressed. 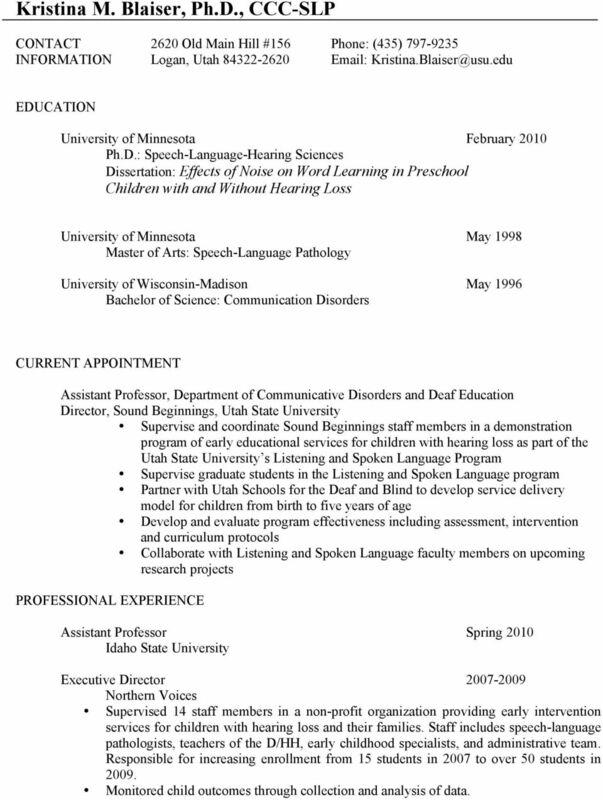 Curriculum Vitae Gloria R. Brister Chair, Assistant Professor Department of Speech and Hearing Science Delta State University Office Phone: 662-846-4112 1000 Sunflower Road Fax Number: 662-846-4099 P.O. 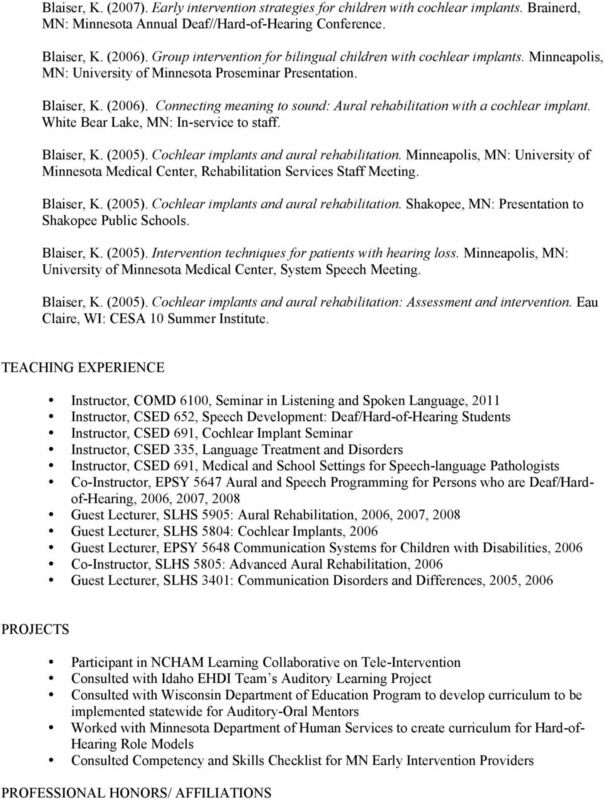 CURRICULUM VITAE Allan B. Smith, Ph.D., CCC-SLP. Education Ph.D. 2002, University of Connecticut (Communication Science). AUDIOLOGY AND SPEECH PATHOLOGY What can I do with this degree? COMMUNICATION SCIENCES AND DISORDERS 2015-2016 COURSE OFFERINGS Version: 2015-08-10 COURSE TITLE FALL WINTER SPRING SUMMER GEN CMN 108-0 Communication Disorders X CSD 112-0 Scientific Exploration of Comm. 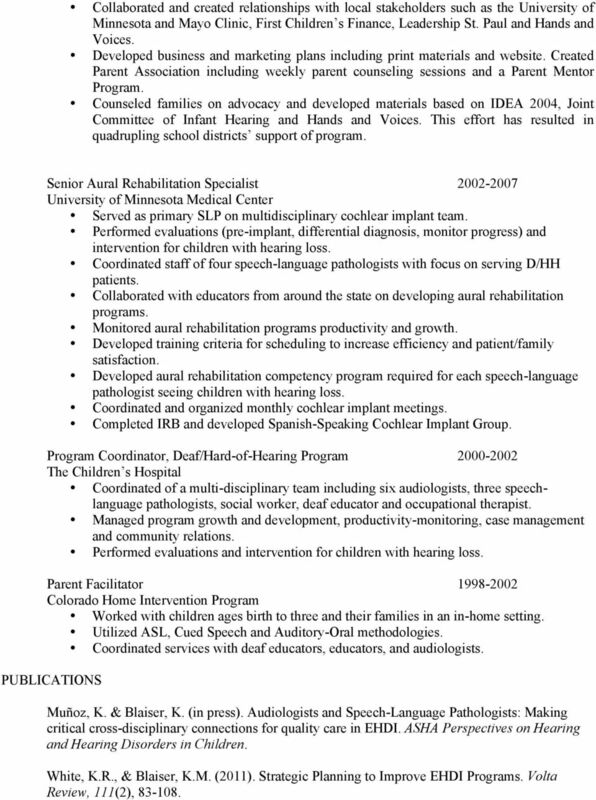 Preparation "Speech Language Pathologist Overview"
Speech-Language Pathology Programs Handbook 2015 2016 Speech-Language Pathology Welcome! Speech-Language Pathology (SLP) offers programs for individuals interested in becoming speech-language pathologists.